Steve Jobs was a digital pioneer and technological entrepreneur whose ferocious drive and tenacious zeal for perfection lead to companies, products and services that today define much of the world’s lifestyle: Mac computers, iTunes, iPhones, iPads, iPods and Pixar movies. But Jobs wasn’t successful right off the bat—and his life wasn’t nearly as sleek and smooth as the clean, uncluttered lines of a thin, new iPhone. “I’m poorly made,” Jobs (Michael Fassbender) confesses to his head of marketing and longtime business associate Joanna Hoffman (Kate Winslet) in Steve Jobs, the sprawling new biopic directed by Danny Boyle based on former Time magazine editor Walter Issacson’s 2010 bestseller. His former partner, Steve Wozniak (Seth Rogen), comes to agree. “Your products are better than you are,” he tells him. The movie begins in 1984 at an event heralding the launch of Jobs’ Macintosh computer, which turned out to be an overpriced, underpowered flop and ended his career at Apple, the California computer company he started in his garage in the 1970s with Wozniak. The film continues through two other “acts,” also around product launches: Jobs’ NeXT cube, in 1985 (another flop), and then the 1998 unveiling of the iMac, which marked his triumphant, full-circle return to Apple. Director Boyle, an Oscar winner whose previous work includes Slumdog Millionaire and 127 Hours, keeps things moving at an almost breathless pace and uses three different types of film (grainy 16mm, standard 35mm and crisp, high-def digital) to define each of the movie’s trio of distinctive segments. The screenplay by Oscar-winning screenwriter Aaron Sorkin is full of the smart, savvy, rat-a-tat-tat dialog that made The Social Network, Moneyball and the TV shows The Newsroom and The West Wing zip and zing. 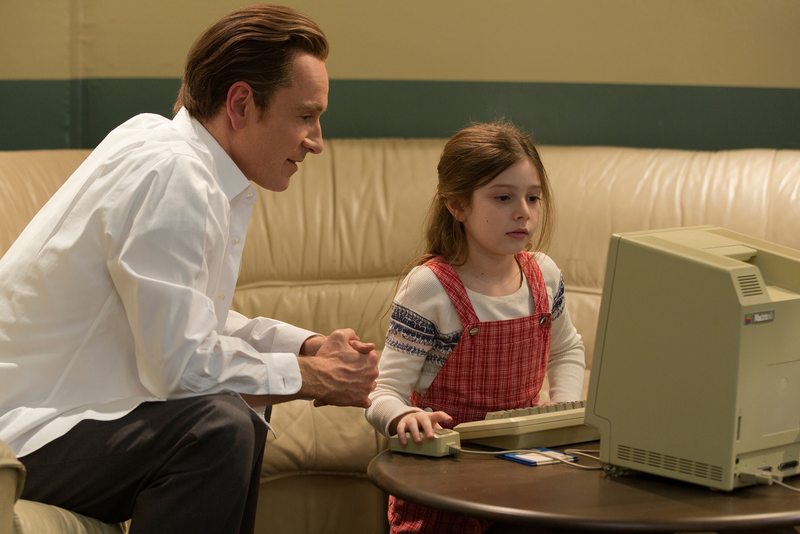 Jobs introduces his daughter (Makenzie Moss) to his latest invention, the Macintosh computer. As the man at the center of it all, Fassbender portrays Jobs across a span of three decades and masterfully summons the powerful gravity that pulled other objects into his orbit—as well as the icy, distant chill that pushed most people away, including his daughter, Lisa (played at three different ages and stages by Makenzie Moss, Ripley Sobo and Perla Haney-Jardine), by former girlfriend Chrisann Brennan (Katherine Waterson). 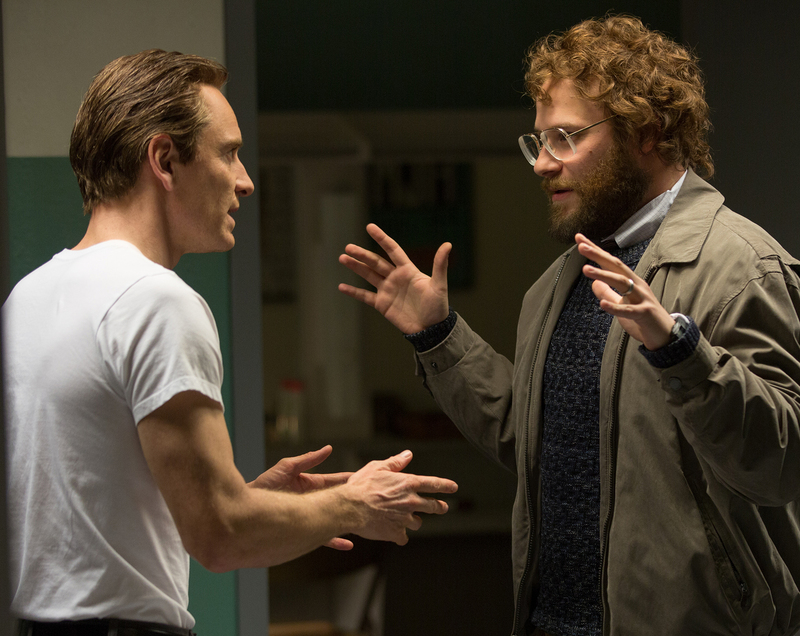 Jeff Daniels, a Sorkin mainstay, plays Apple CEO John Sculley, and Rogen steps outside his usual stoner-comedy roles as Wozniak, who comes to resent his former partner’s arrogance and hubris, his dismissive treatment of everyone who was ever close to him, and his rise to rock-god-like stardom. Jobs—who died in 2011 from complications of a pancreatic tumor—may have been a tech and marketing genius, but Steve Jobs makes it clear he could also be a colossal jerk. To gazillions of Apple product uses, however, he became a guru, if not a messiah. Maybe that’s why Doyle’s closing shot—with Jobs bathed in blinding light, beaming, walking slowly into the camera before disappearing into a wash of white—looks so much like a resurrection.